Summer was a time of little progress house-project-wise but at least there were occasional bits of seasonal fun. Now to get rid of the icky wallpaper in the bathroom. 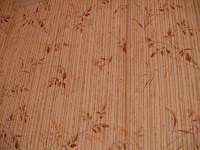 WHY DO PEOPLE PUT WALLPAPER RIGHT ONTO NAKED DRYWALL? Presumably they are so in love with the pattern, that they can't imagine anyone wanting to get rid of it, not even thirty years later. Argh. We had this in our last house, similarly bedecked in the '70's and made a mess trying to get the stuff moist enough to be scraped off without taking the whole face of the wall with it. I know what you mean by the wallpaper.... I scraped for Weeks and tried everything. The ol'fabric softener trick seemed to work best and left the house smelling like fresh laundry!